The cucumber is an annual that originated in India, where its wild ancestor Cucumis hardwickii Royale may still be found in the subtropical valleys of the Himalayas. This ancient cucumber is bitter, as a protection against animals eating it before it is ripe. 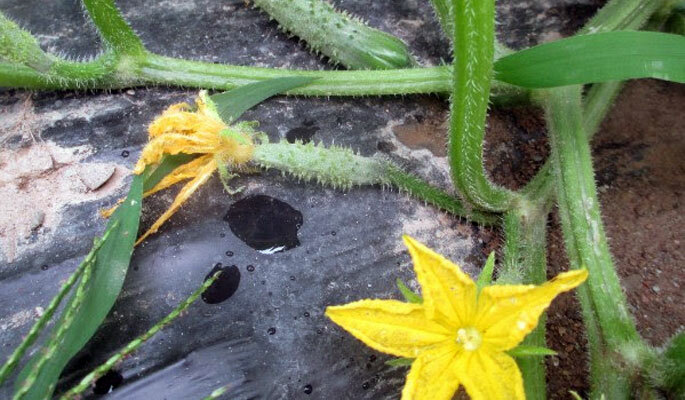 This natural bitterness still lingers in many cultivated forms, often in the skin or, in the very long-fruited varieties, in that portion of the cucumber closest to the stem. In colonial America the cucumber did very well. Our hot summers appeal to its subtropical temperament, and many of the soils along our eastern coast are of the loose, sandy kind that cucumbers like. Thus, while the cucumber was for a long time a symbol of the gentleman’s kitchen garden in England, in this country it quickly became as common as the watermelon. In fact, the two were sometimes grown together in the same patch.